JOHOR BAHRU: Police and two enforcement agencies seized 2.06 tonnes of drugs, believed to be syabu, worth RM103.2 million following the arrest of six members of an international drug smuggling and distribution syndicate in Ulu Tiram here on Tuesday. Federal Police Narcotics Criminal Investigation Department director Datuk Seri Mohmad Salleh said the seizure, the biggest in their history, was a result of three raids conducted between 7.30am and 10am. “The first raid was on an oil palm estate in Taman Desa Cemerlang, where three local men aged between 35 and 48 were held and the 2.06 tonnes (2,060kg) drugs were seized. “The drugs were kept in containers packed using Guanyinwang Chinese tea wrappers to hoodwink the authorities,” he told a press conference here today. Mohmad said that in the second and third raids carried out in Taman Pelangi and Taman Desa Cemerlang respectively, they arrested three more local men aged between 25 and 49. In both the raids, police did not make any drug seizures but confiscated seven types of vehicles – Lexus, Toyota Camry, Toyota Estima, Nissan Cefiro, Nissan Navara, Ford Ranger and Proton Inspira – cash, jewellery and watches worth RM489,000. He said the success was due to a two-week joint intelligence operation carried out by the police, Royal Malaysian Customs Department and Malaysian Maritime Enforcement Agency (MMEA). 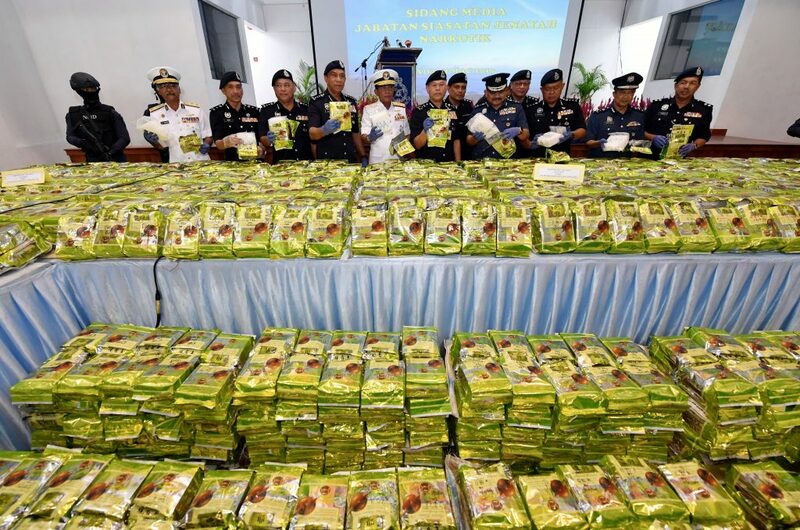 “We believe the syndicate only began operating two weeks ago by making Malaysia the transit point to bring in drugs from the Golden Triangle (Thailand, Myanmar and Cambodia) via sea. “Then, the drugs are packed in mini laboratories here before being distributed to local and overseas markets like Singapore, Indonesia, the Philippines, South Korea, Japan, Australia and New Zealand,” he said, adding that the drugs seized could be supplied to 10.3 million addicts. 2.06 tonnes syabu worth RM103.2 mln seized in biggest bust ever 0 out of 5 based on 0 ratings. 0 user reviews.